I won't lie, I find the fact that people are supporting all this quite wrong really, by doing these experiments and writing up detailed reports of it all you are giving people a how to guide which I am almost certain will be used to rip someone off. I am also still a firm believer that this is doing something to the plastic that can't be undone and in time we will see I guess. Odd really that certain people can be against touch ups yet are all for dunking figures in cocktails of chemicals to turn them white again..
Edit- Steve my grumble about the thread is not entirely aimed at you, I know you are a good bloke and there are a load of these threads out there so it's just a general moment than anything personal. I don't actually see anything wrong with it, in reading this thread it would seem you are just basically opening back up the pores of the plastic and cleaning out the dirt and grime that has gathered there.....I know it is peroxide but it seems to be just cleaning out the dirt and not bleaching as it doesn't affect any of the paint. I hate repro's and I wouldn't have a touch up figure! But i'd have one that has been cleaned to remove the dirt. Like i said i don't anything wrong with it but thats just me. I don't honestly think this as simple as comparing it to cleaning up the figure, this is not taking a baby wipe to a figure with some mud on it, discolouration is not caused by a figure being dirty, the plastic has changed due to the elements or age. People who have done this experiment have been honest and said the yellowing comes back and the figures can need more treatments, if it was just a bit of dirt it would be gone for good IMO. Time will tell with regard to what it's actually doing to the figures but even if we were to make a crude comparison with regard to bleaching hair, bleach strips the natural colour of the hair, if you bleach hair too much it can damage it so much it will fall out.. I honestly don't think it takes a degree to work out this is doing something to the plastic that can't be undone. Imperial nut wrote: As my theory above suggests the cause is heat and exposure to dust and other particles. Joe wrote: discolouration is not caused by a figure being dirty, the plastic has changed due to the elements or age. I actually think the discolouration is because the figure is dirty. I see both sides of the arguement, TBH. At the end of the day though and me being me, I was willing to give it a try to satisfy my own curious nature. I personally don't see the problem with it as long as there's no real damage made over time. It's down to the individual that wishes to try it. No one held a gun to my head. Reading about others that have used the method (and used additional ingredients), it SEEMS to be perfectly safe with no reports of damage down the line. What I have read though is some people have overdone it with the percentage of peroxide used and have experienced kind of white spot damage to plastic. This being used on retro style computers that have yellowed badly with time. The way I see that is, too much is like not enough. I've also seen some methods used just right and these things made too look like brand new. Actually yellowing is most likely to come about from bad storage conditions or exposure to the elements, like leaving a figure in the sun or half buried in the ground or sand box, a bit of mud or dust won't turn a figure yellow. Figures break down and react to other plastics as well so keeping them in plastic bags with no air holes and in a sealed container for example may result in yellowing, those figures are not dirty- they are degraded due to the plastic breaking down or reacting with other things. Edit- I once put my mint han carbonite figure face down in his carbonite block, sealed him up in a zip lock for storing while I moved a million miles away from home, 2 years later his torso was completely yellow yet only the front! To me that says it all, the plastic of the block and the figure reacted in an environment with little to no air and the result was yellowing. The back of the figure was like new and like it was when I put it away..
Second Edit- - What about figures that have discoloured in the bubble? Torsos and limbs that are completely different colours, that's not dirt if the figure was sealed is it? Here's another example of someone using the 6%, 20 Vol, Hydrogen Peroxide (Neat) method. On appearance it only seems to attack the desired area and not damage the enamled/glossy effect of the white plastic. Whether or not this maybe something that will now deteriorate over time remains to be seen, but no reports as yet. Whenever this topic comes up, I like to point to this article on why plastics yellow. I know most have read it already, but for those that haven't read it, it is worth the read which goes into the chemistry behind it all. I think if anyone was to sell a figure using this method, that they should be marked just as anyone else would want a repro marked. We have no idea what will happen to these figures in say another 10 years. They very well could look worse than the yellowing they show now. I agree one should disclose that they have bleached a figure before selling. 100%. I also don't think it would bother most buyers. I'd pay a lot more for a bleached Stormtrooper than a heavily yellowed fit for the bin Stormtrooper. Time, it seems, has already damaged a yellowed figure so i pretty much don't care what happens to it in 10 years because of bleaching. I personally can't see it doing much more harm, and there certainly isn't any proof of it, than time itself. Just my opinion tho. PGowdy wrote: Time, it seems, has already damaged a yellowed figure so i pretty much don't care what happens to it in 10 years because of bleaching. I personally can't see it doing much more harm, and there certainly isn't any proof of it, than time itself. Just my opinion tho. PGowdy wrote: I'd pay a lot more for a bleached Stormtrooper than a heavily yellowed fit for the bin Stormtrooper. So, you wouldn't honestly care about something you paid MORE for? If people were giving these stormtroopers away for free I could see where you are coming from, but you can't spend good money on something that has been bleached and then not care what the future outcome might be! If you are that happy with throwing money away you know where I am! And that is where the problem lies, people will pay more for a pure white Stormy over a yellowed one, so if they have been bleached they need to be marked and the buyers need to be aware. The equivalent is someone doing a really good reseal of a rare MOC and selling it to you for a decent chunk of change as an original seal. It's been tampered with so it needs marking as such and not sold for more money than what it's actually worth. No. If someone had a dirty yellow stormtrooper for sale for £3, i wouldn't buy it. (not even for £2) Often they can't be fixed with peroxide so i wouldn't even bother with it. However, if someone was selling a nice white one and stated "i have given this a bit of a bleach hence the low price" for £4, i would buy it in a second. No problem. As i stated above- I agree that people shouldn't be selling them without disclosing that they have bleached them but if the price reflects that then i don't personally have a problem. PGowdy wrote: I agree one should disclose that they have bleached a figure before selling. 100%. I also don't think it would bother most buyers. 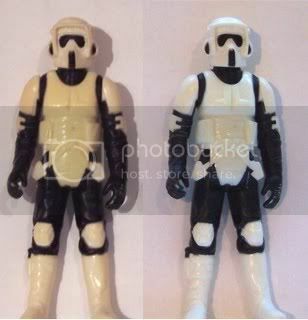 I'd pay a lot more for a bleached Stormtrooper than a heavily yellowed fit for the bin Stormtrooper. Time, it seems, has already damaged a yellowed figure so i pretty much don't care what happens to it in 10 years because of bleaching. I personally can't see it doing much more harm, and there certainly isn't any proof of it, than time itself. Just my opinion tho. How about this then. Let's say the bleaching deteriorates the plastic even faster and your white stormtrooper becomes crumbs after a decade. You'd honestly pay more that even though the risk is there? I know that is on the extreme side, but we honestly don't know. At least with a yellow figure you know it hasn't been altered and will only deteriorate at the normal rate. In reality is it really getting that difficult to find a white stormtrooper? I honestly haven't looked in a while. I'm happy to risk £4-5 on that scenario not happening, yes. Without any proof or evidence that this could happen i'd not worry myself assuming that it will or even could happen. You could say the same about ROTJ bubbles "I believe that in 10 years most of them would have turned dust" Ok, sure. They might. And er, they might not. i just noticed the activity on here and there are some good points raised here. I know i am not the only person on here or on any of the many SW forums who have tried this, some have posted results and others have gone into complex descripitions of how to do this. Either way i was curious and tried it on a few stormies and left it at that. It would be nice to have beautiful white stormies but i cant afford them, so i collect beaters and it will stay like that as i dont think you can put an army together without some beaters. the main reason as mentioned above i dont know what will happen to the figures later down the road so my tests only involved 6 of my worst offenders. and as i am nearing 150 stormies yellowing is something i have a lot of. Joe - no offence taken on your point, i tried to be as vauge with my measurements and ingredients but the info is out there, (and if folks want me to delete the posts, as they have been read) i really didnt want the scammers to do this either. but as for the whole dirt versus plastic degredation , i just put forward an alternate theory based on some research but it was just me trying to figure out how this happens. Anyway feel free to get the mods to remove the thread or i will delete the posts. As you never know who is on here and although we cant stop someone from getting the info we could make it harder??? Appreciate your concern with wanting it to be deleted Steve but as you said it's on the net on loads of forums so people will find the info if they want, I never set out to directly attack you (and I am still not! lol) it's just that this was the only active thread going so here is where it happened lol. My beef really is with people that I am sure are against any other kind of touch ups or repaints/reseals etc yet are nonchalantly saying "Oh yeah wow look at those lovely white figures off I go to get some chemicals! Great idea!" etc etc without thinking about the repercussions. It's just the same when people bang on about reproduction sellers then go buy some repro DT sabers..boggles my mind. I think it says it all if you yourself wouldn't buy chemically altered stormies. I don't think there is much more to say really after that! Let's just hope this hasn't already become commonplace in the hobby (although anything is possible lately) and we don't see these appearing on ebay, disclosed or undisclosed - all bad news when resold.